I’ve long been an Instagram fan, but becoming a breastfeeding mum turned me into a proper addict. When I wasn’t googling ‘why won’t my baby sleep in . . .’ and ‘is it normal for my newborn to . . .’ during those first few weeks, I spent our wakeful nights scrolling through my favourite accounts, imagining all the delicious treats I would make when I had a moment without a baby attached to my chest. Now we’re nearly four months in and Nino is sleeping through the night, I’m not quite so scroll happy, but still love spending time during the day to catch up with my favourite Instagram feeds. Ok, that’s a lie, Nino still wakes up a couple of times to snack on a good night, but he now nurses quickly in complete dark, the two of us rolling over and back into sleep as quickly as possible without the distraction of technology. Regardless of when you get your Insta-fix, I thought it would be fun to compile a list of my favourites – a mixture of beautiful photos, sugar-laced treats, mum and baby eats and more. Enjoy! 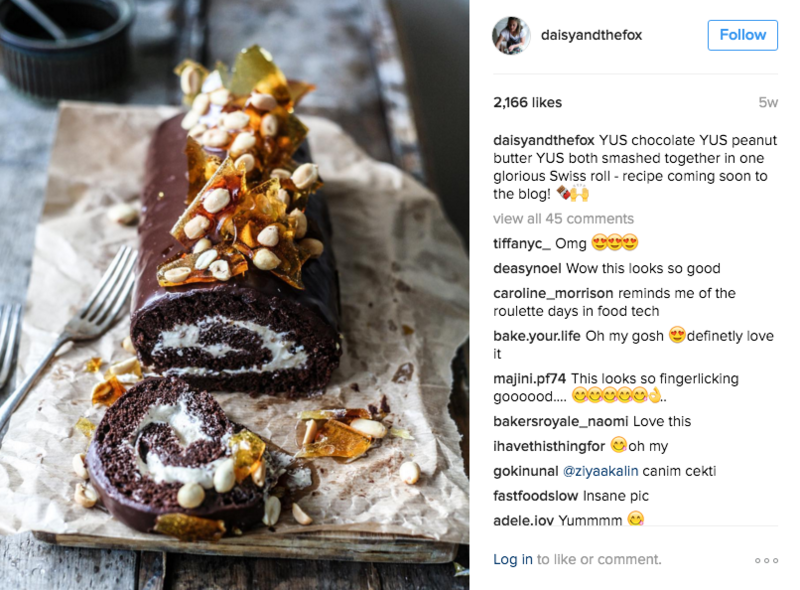 20 year old Bec is the insanely talented cook and photographer behind the @daisyandthefox account and blog of the same name, sharing both sweet and savoury deliciousness. This chocolate peanut butter swiss roll with shards of caramel is the cake of my dreams. 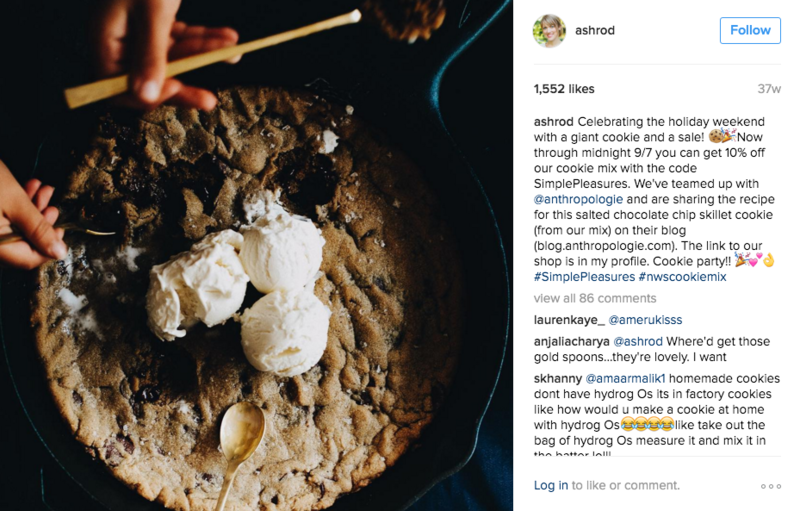 @ashrod is Queen of the chocolate chip cookie (she even sells her own mix), mum to three gorgeous kids and author of both the blog Not Without Salt and cookbook Date Night In. This lady knows her way round a kitchen and a camera and her pictures are a joy. 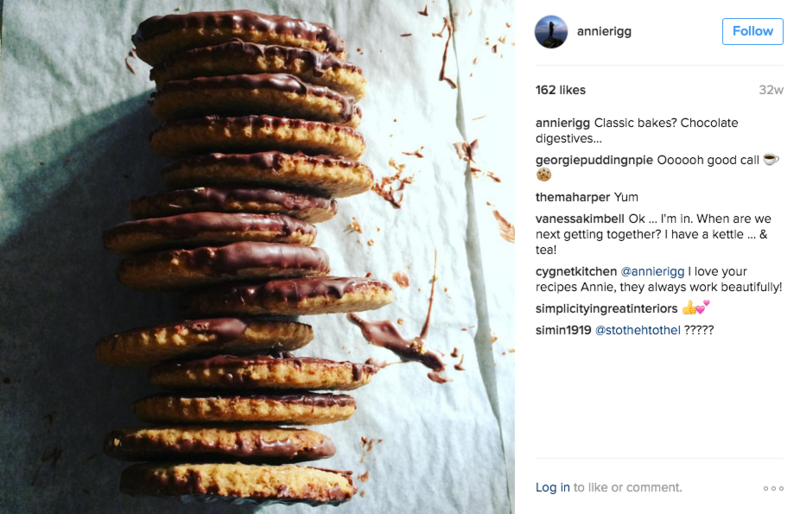 Author of numerous cookbooks – both under her own name and for brands like The Great British Bake Off – @annierigg is a food stylist and recipe developer extraordinaire. The composition of and light in her photos are just beautiful. Oh and she has the cutest four-legged friend who often makes an appearance in photos. Rosie Birkett’s cookbook, A Lot on Her Plate, has to be one of my favourites published last year, worth the cover price for the octopus salad and porchetta alone. 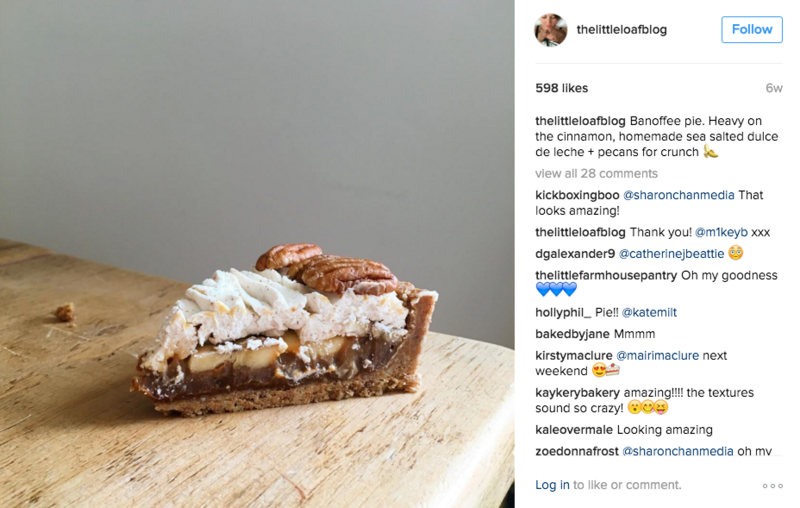 Her Insta feed is equally appetising and she also makes a mean salted butterscotch popcorn cheesecake (oof!). 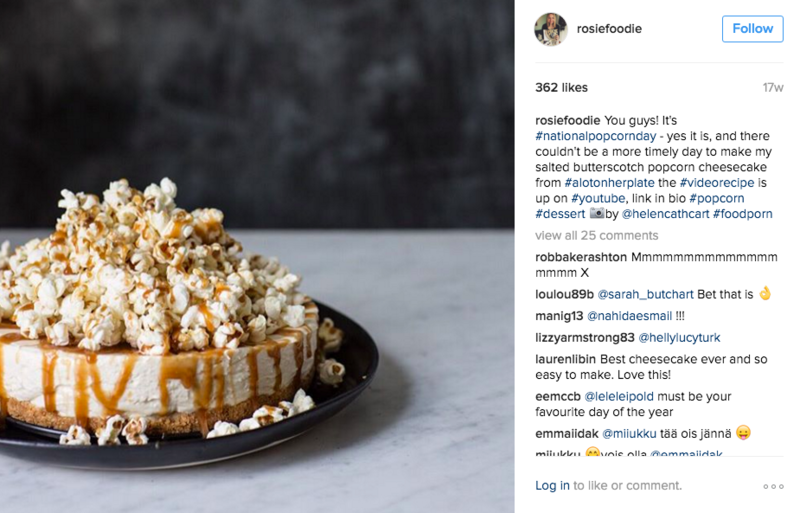 Follow her @rosiefoodie. 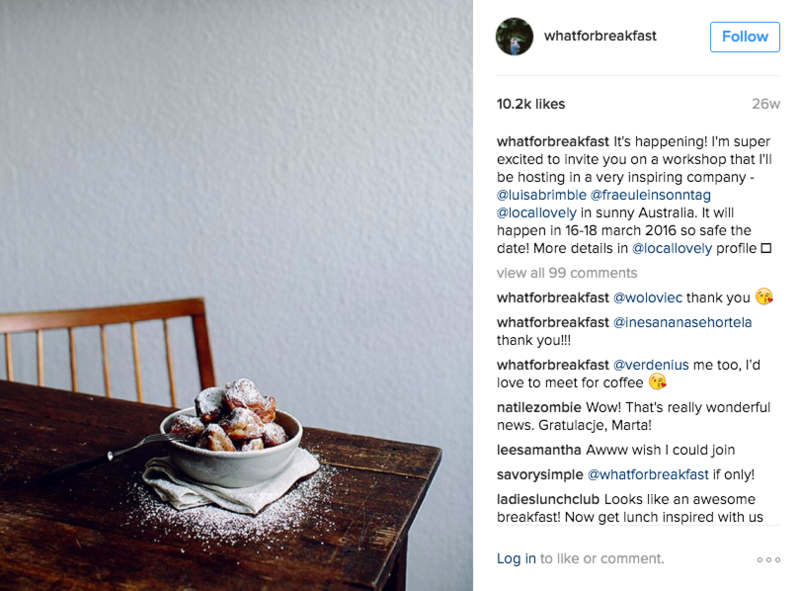 If you’re ever stuck for breakfast inspiration, take a look at the stunning @whatforbreakfast feed and blog of the same name. Marta makes the most beautiful dishes – some healthy, some indulgent, all utterly insta-licious – and captures them against the background of her stunning wooden breakfast table. 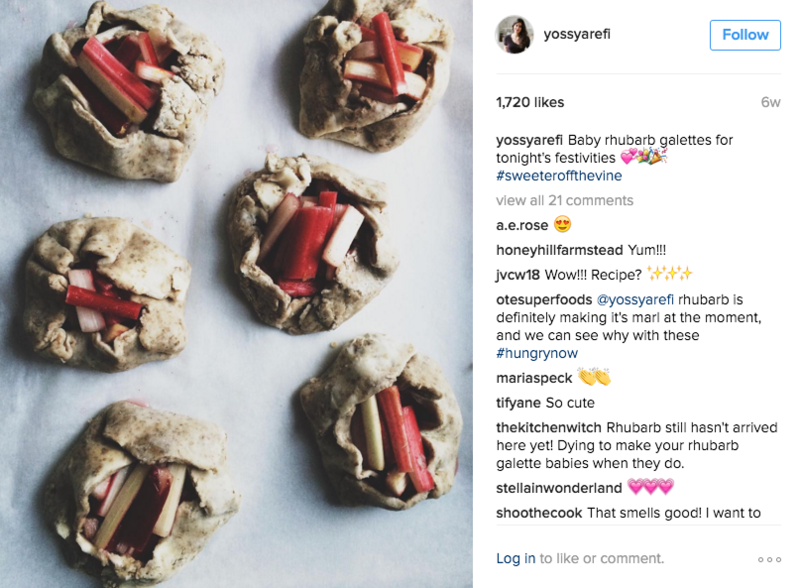 Another blogger who recently published a cookbook, @yossyarefi‘s Instagram feed is full of colour from all the stunning seasonal fruits she bakes with. I’ve also got my eye on her tahini stracciatella ice cream. 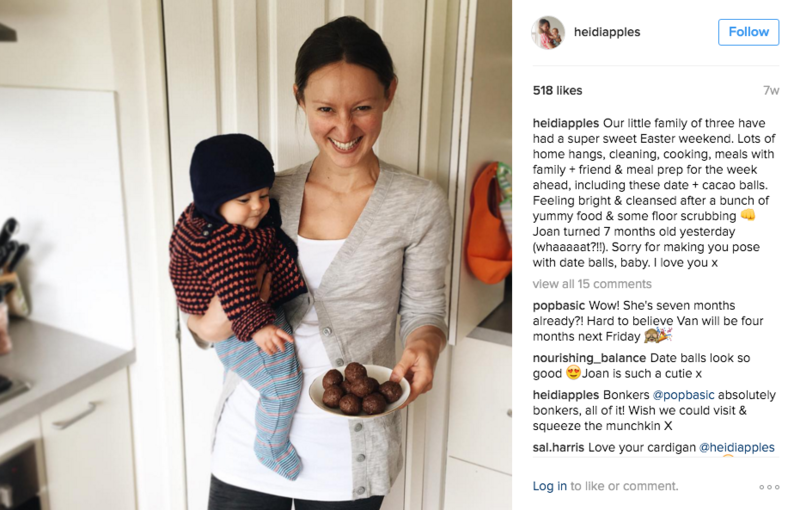 Australian dietician Heidi has an online food journal and documents her daily eats through her @heidiapples account. I loved following her pregnancy eats series (she’s a new mum to the seriously scrumptious Joan, pictured) and I’m now enjoying following the two of them through their baby-led weaning experience as Nino and I gear up to go onto solids in a couple of months. 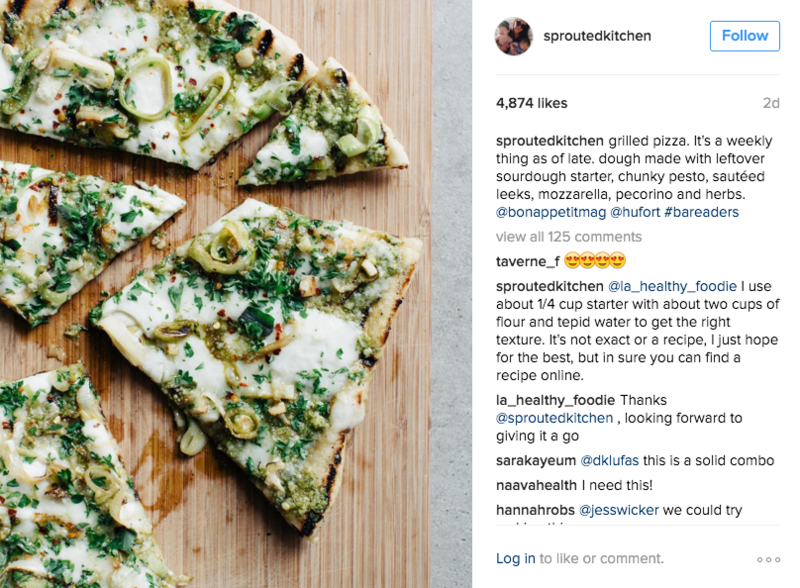 Sara’s Sprouted Kitchen blog likely needs no introduction and her@sproutedkitchen account is every bit as delightful. Healthy food that truly tastes good, an inspirational Californian setting (oh to live somewhere hot and sunny by the sea) and occasional posts on feeding babies, this is aspirational lifestyle stalking at its best. 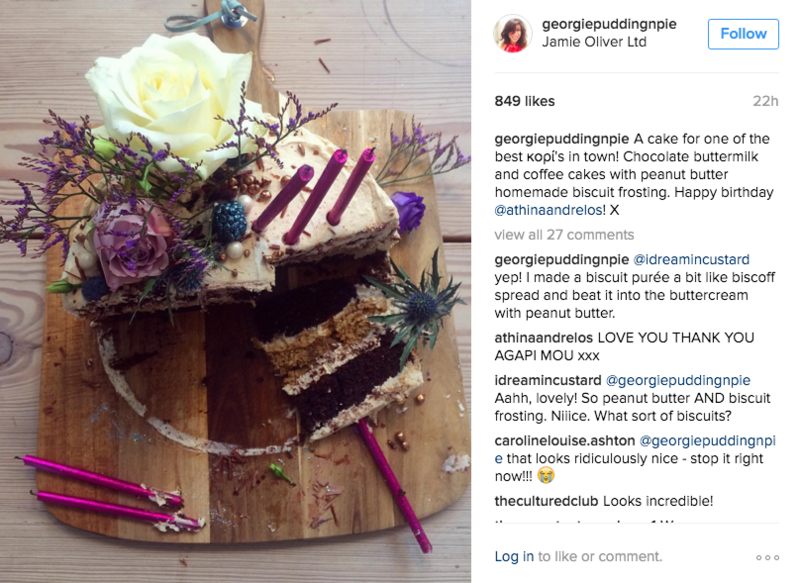 Georgina of @georgiepuddingnpie is a recipe developer and stylist for Jamie Oliver and her photos of food are bright, delicious and always inspiring. I’m more than a little bit jealous of her job. 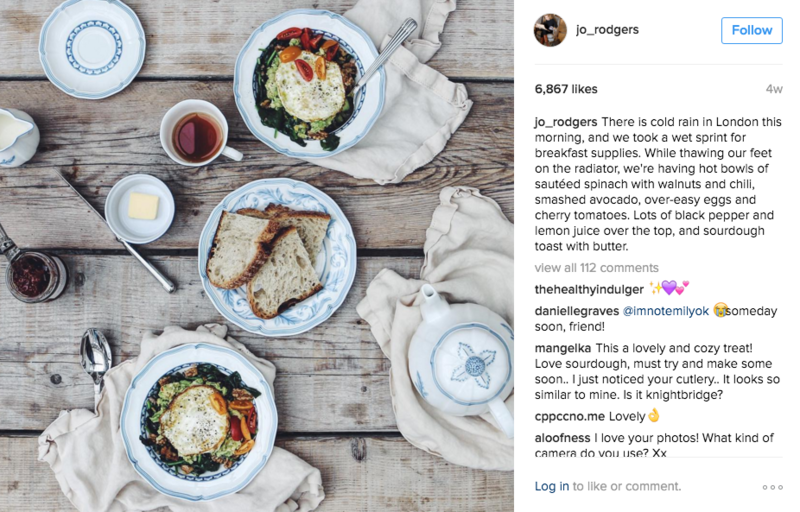 When I’m in need of some r&r, I’d love to leap into @jo_rodgers‘ Instagram world and spend a few hours eating, reading and relaxing in the cool, calming light of her photos. She captures life beautifully, both visually and with words. Milli is the canapé queen of South West London and makes a mean brownie to boot (I’ve had the pleasure of sampling them). I got some brilliant restaurant recommendations from her before our trip to Seville last year and her photos never fail to make me starving. 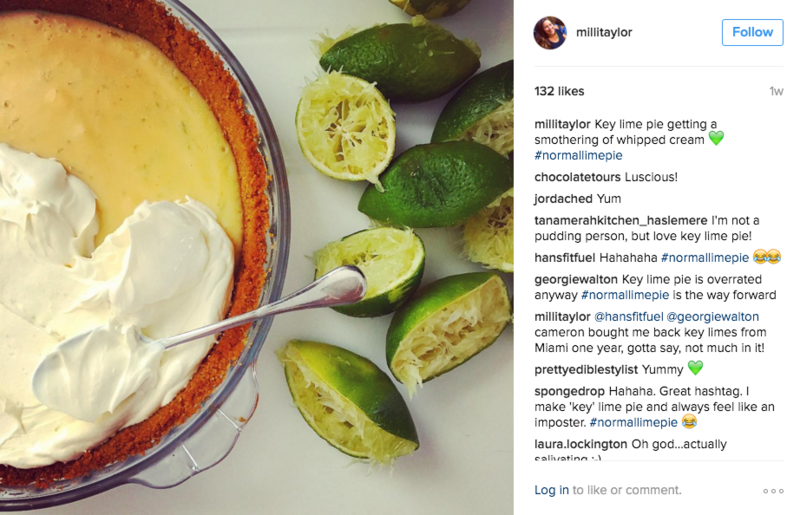 Follow her adventures in the kitchen @millitaylor. 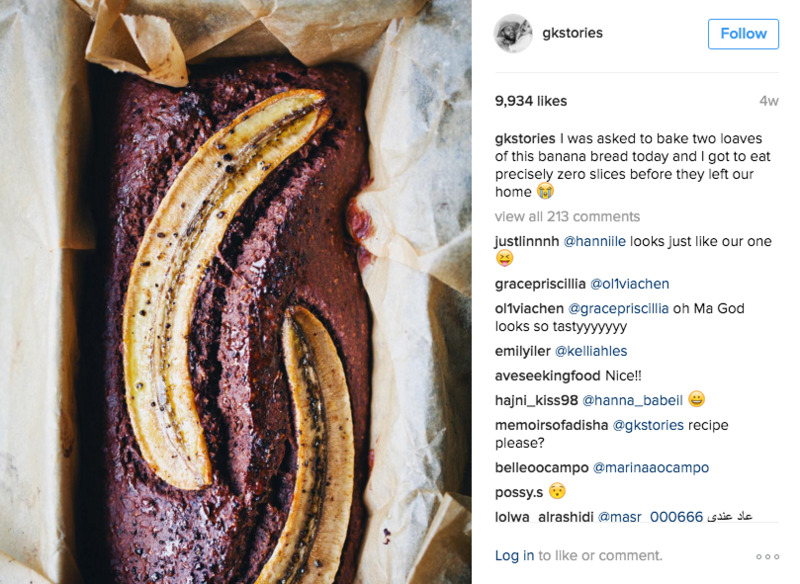 Another blog that needs no introduction, @gkstories is the perfect example of what I look for in a foodie Instagram feed: gorgeous lighting, colours and textures, wholesome food you really want to make and eat and plenty of travel-inspired eats as well. 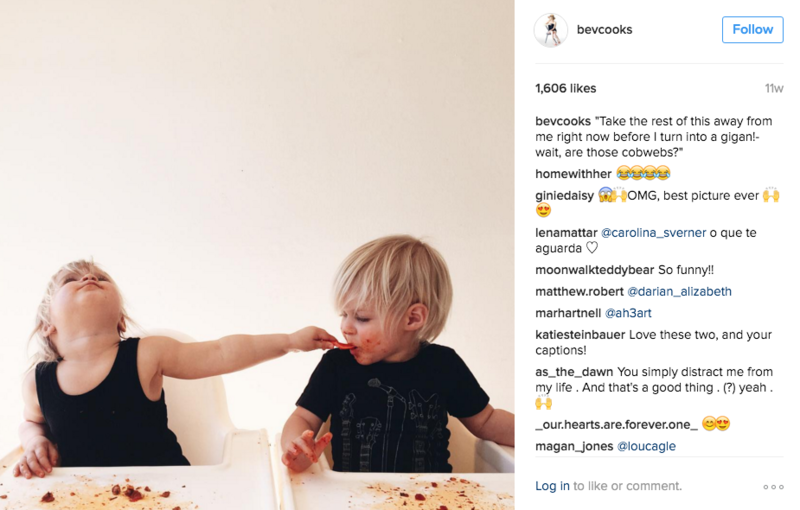 Bev Weidner has the most adorable blonde twins you’ve ever seen, makes delicious food and captures it all with beautiful photography and a unique sense of humour. Her captions never fail to make me giggle. Follow her @bevcooks. 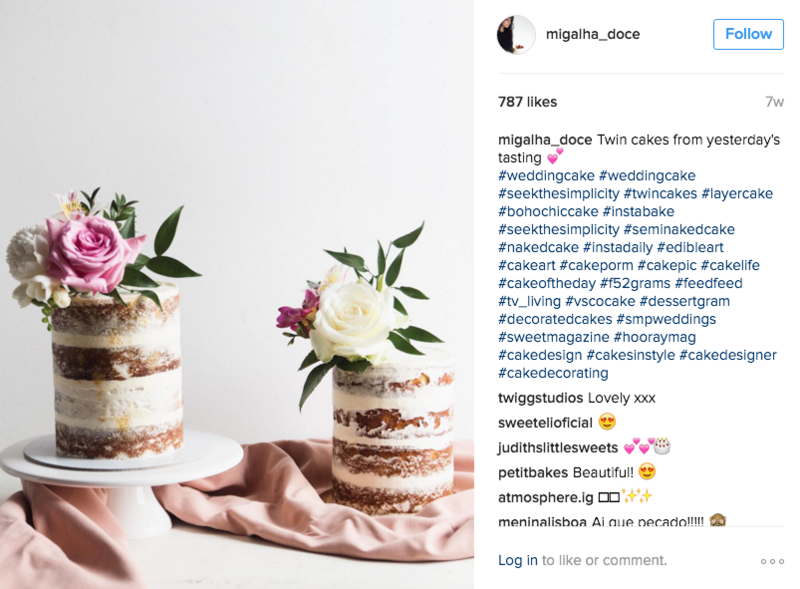 If you like cake, you need to follow @migalha_doce. One day I will have the patience and skill to make cakes like Sandra does. Maybe. 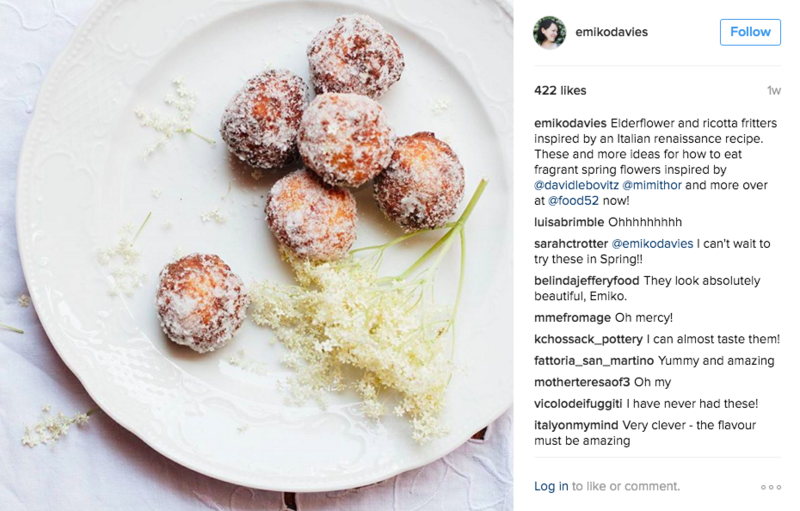 Last but not least, @emikodavies makes divine Italian food and captures both recipes and the places they come from in her stunning photos. I’ve mentioned her cookbook, Florentine, here before and will be posting a review soon – in the meantime, check out #florentinethecookbook to see what others have been making from it. Love this post! Instagram is my favorite form of social media, and I am always looking for new accounts to follow. Love these, thank you! I’ve just started BLW and am loving the Instagram inspiration. @what_sebbie_ate is my current fave for proper family recipes.